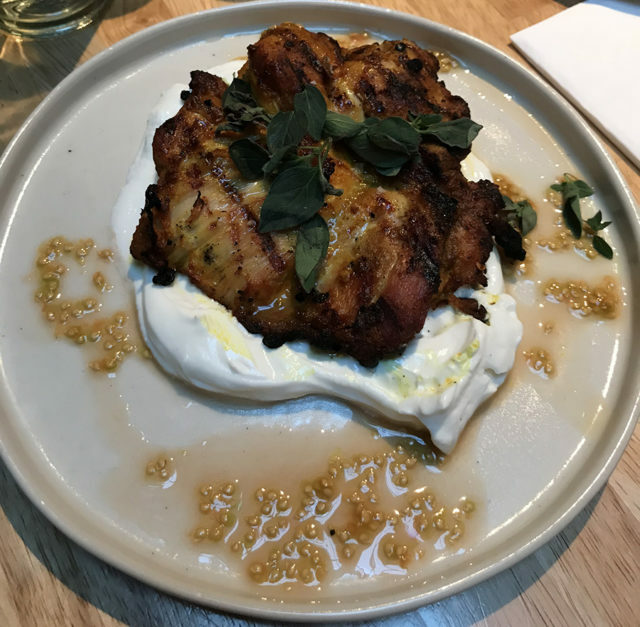 Sarona is a modern, stylish restaurant honing in on fresh middle-eastern cuisine. 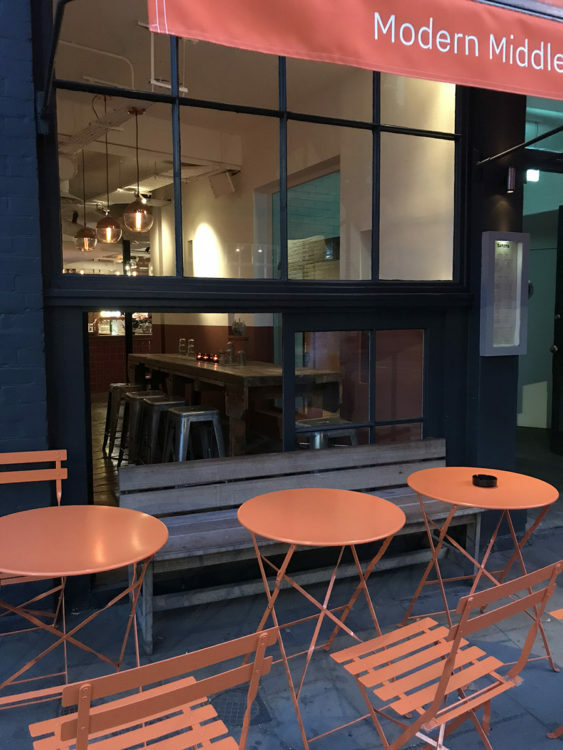 Yet another restaurant only a short walk away on Clerkenwell Road, the easiest way to get there is go walk down to Smithfield, turn right onto St John Street and turn left onto Clerkenwell Road. 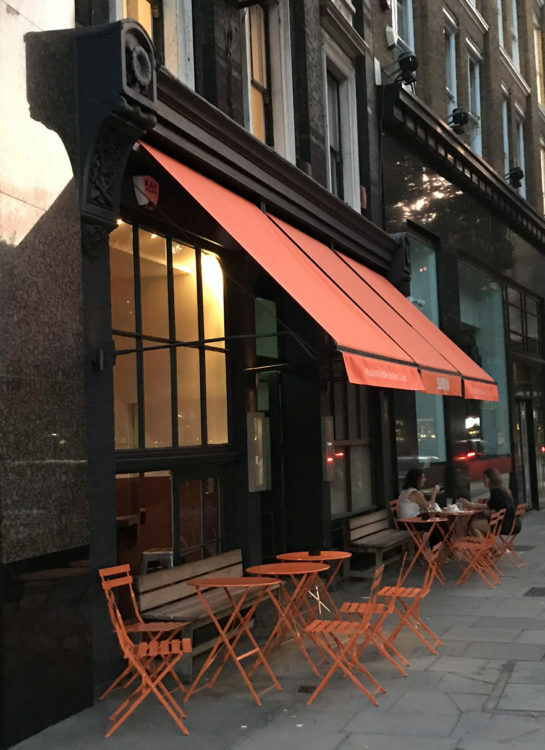 The frontage is branded with awnings, tables and chairs all in bright orange so it is easily noticeable after you turn the corner. The pavement in quite deep here and so the hustle and bustle of the main road doesn’t intrude as much as you might expect. The large windows also open up from the inside so if you want the outside feeling but with a little more peace, then you can sit just inside. 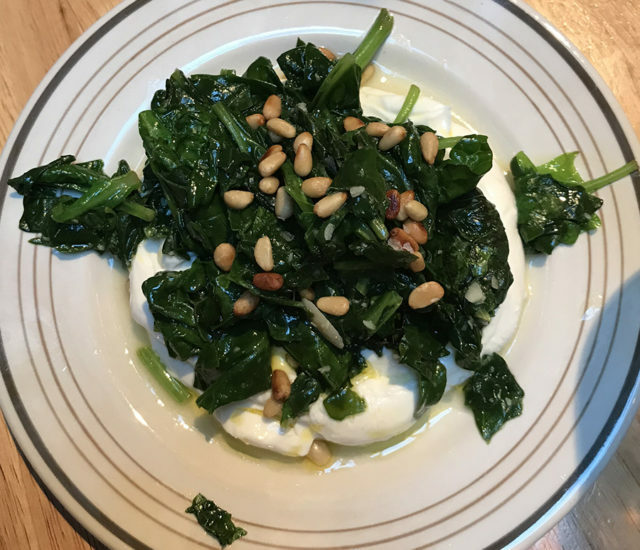 Sarona is an all-day dining bar & restaurant which makes it flexible enough for breakfast through to supper. The interior is cavernous and yet there is an upstairs with more dining and for functions. 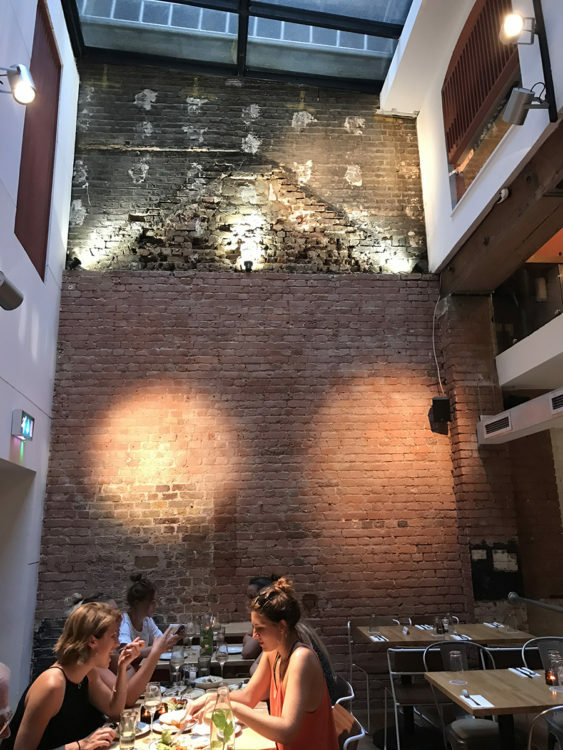 The massive windows at the front and rear of the restaurant really open up the space inside and you feel like you are eating in a bright conservatory at the back of the restaurant where you’d normally expect to be totally artificially lit. There is a range of seating throughout the room for diners: from traditional bench and chair seating, to barstool high tables. The combination of seating, lighting and all-day menu gives you a flexible meeting up place. This is a new restaurant and the service was fantastic: attentive, educational and professional. Mint water in large carafes on the table means that you won’t have to beg for free water, and the menu is great for snacks or more substantial meals, for sharing or dining. It would be an excellent place for vegetarians given many of the dishes are meat free. There is a fair selection of wines from France and Spain but ‘when in Rome’ persuades us to choose from the selection of wines from Israel. There is also a Coravin which enables some exceptional wines to be sampled by the glass without having to splash out for a full bottle. There are also Israeli and Lebanese beers to choose from and some homemade Lebanese lemonade. The evening was a general launch event, and so the portion sizes may be larger in our photos but that is good, because if we’d entirely polished off any one of these dishes, we wouldn’t have been able to eat any of the others at all. The dishes came out thick and fast, so it is easiest just to list them. When ordering, I’d recommend a tapas-method, because the ingredients are fresh and filling and every plate is a mini-feast. 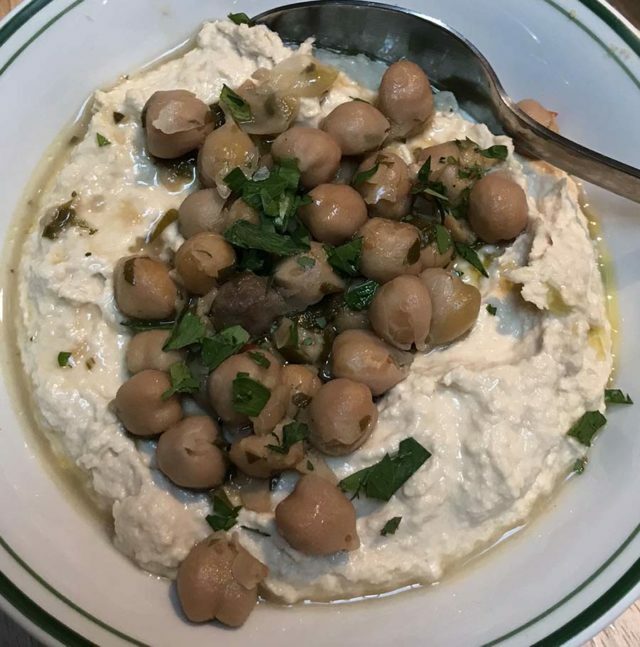 The restaurant is rightly proud of its homemade hummus and pita bread. Visit if only for a taste of this combination. There is nothing quite like fresh bread, and the same goes for the fresh, warm pitta as it comes out of the kitchen. This was one of my favourite dishes; it is healthy, full of flavour and filling. In the photo the oregano looks like moss, but I couldn’t believe it was just oregano when I ate it; something about the combination is very moreish. This is another dish that won’t make you feel too guilty but is very tasty and filling. 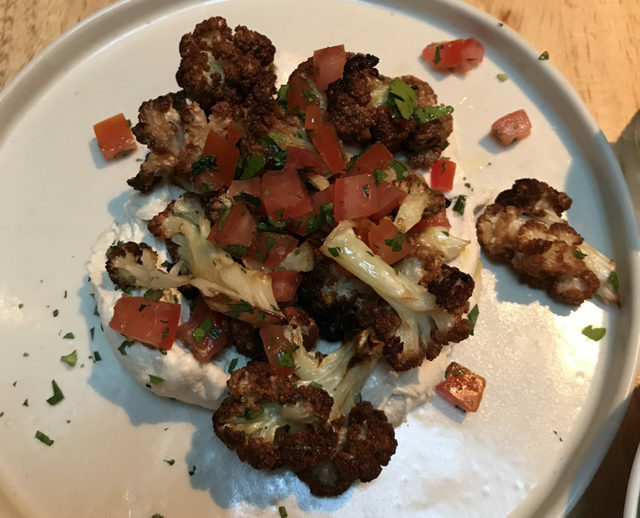 This is my first conscious coupling with Sumak (sumac) as a spice and the faint tangy lemony flavour combined perfectly with the cauliflower. 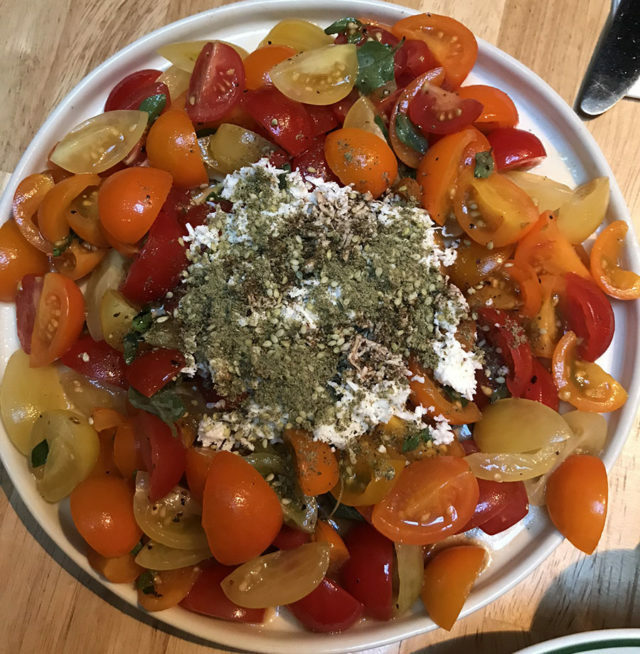 For me, this was another favourite because it is a healthy filling dish, the vegetables are not over-cooked, and the plate is full of colour and flavour. 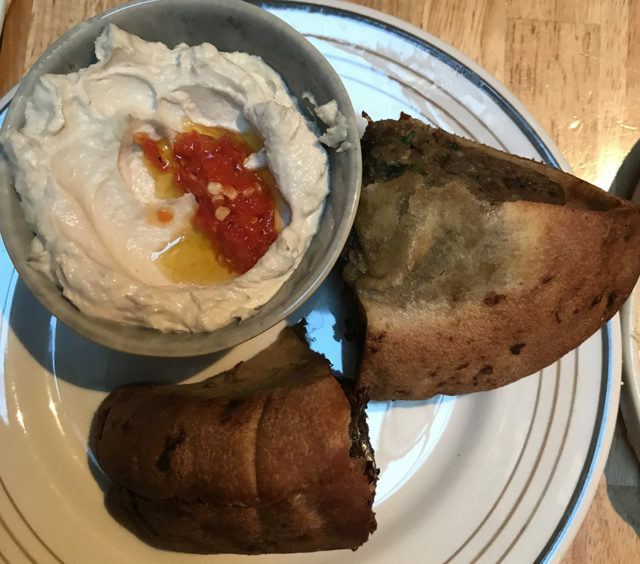 Now we were moving onto the more substantial dishes and the lamb arayes were really delicious; the gently spiced lamb minced into the crispy baked pita was very filling so beware of over-ordering on this plate. What’s not to love about this plate (as long as you like prawns). 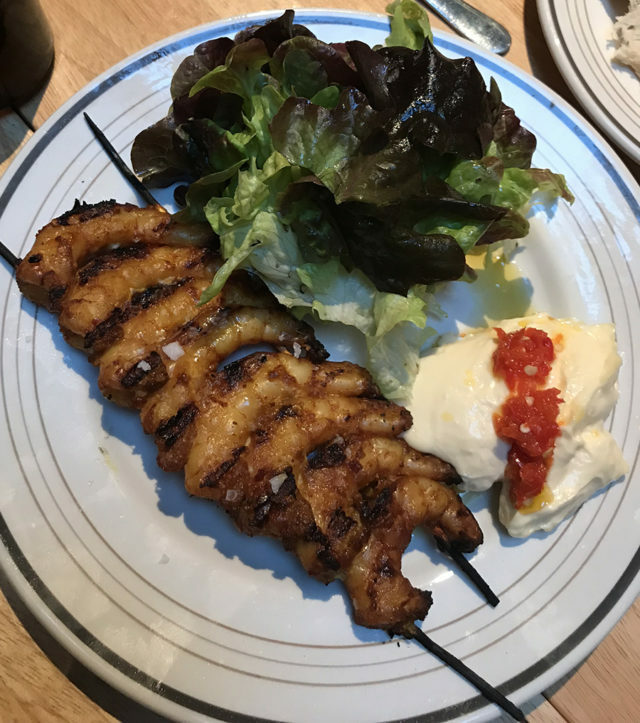 My partner thought the prawns were a bit tough but this is a grilled dish, and I loved their thick meaty texture. I’m not sure of the size of the dish that you will end up with for the £14, but if it is anything like this sample plate, then this is all you need for a meal. Both my partner and I loved this dish (despite the lack of appeal of the photo). The chicken was grilled, tender and tasty. It wasn’t a dish for fingers so it is more of a main meal than a snack, but a very decent dish. 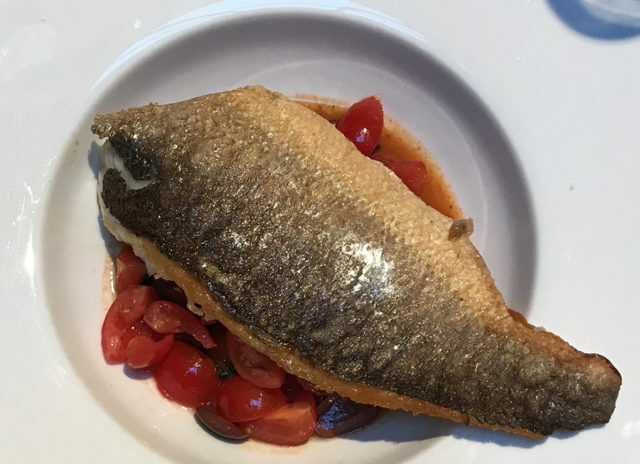 Perfectly prepared sea bass with fleshy flakes and crisped skin. The value of this dish will depend on the proper portions because we had the whole fish to share here! This is a ‘must try’ pudding. 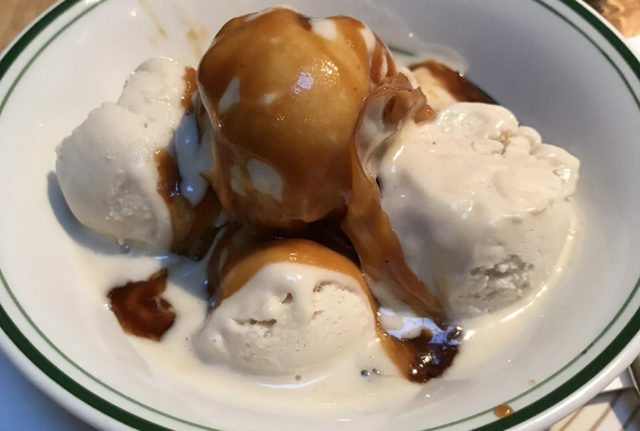 I know that you can make ice cream our of any flavour, but who has the time, so hop down for a plate of this before the weather turns too cold; it is delicious. 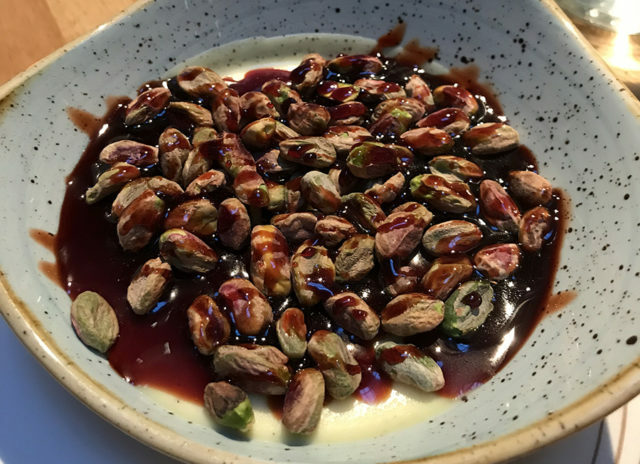 The panna cotta wasn’t as wobbly as some I’ve had in the past, but then they didn’t have to support a ton of fresh pistachios, smothered in delectable, thick date syrup so I can understand why the creamy base of this dish has a bit more substance to it. I really enjoyed the taster of Sarona. 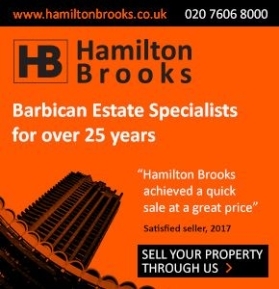 It is great for all budgets, it is something different and the staff deserve for this place to work. It is only a little walk away so I’d recommend a stroll. With a good wind then perhaps we can expect weekend opening soon.